In "Don't Sleep With Stevens!" Timothy Minchin explores a major union campaign to organize J. P. Stevens, a giant textile firm that employed over 40,000 southern workers. 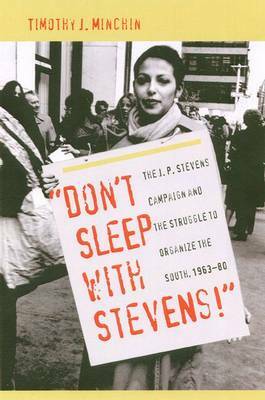 Between 1963 and 1980, textile unions targeted Stevens because they reasoned that if they could organize such a large employer, it would open up the South to organized labor. Stevens, however, vehemently resisted the organizing drive, repeatedly breaking labor laws in the process. The high-profile battle took on a symbolic importance, especially after the union initiated a boycott of the company's products. Launched in 1976, the boycott secured national press coverage and mobilized many supporters, including political leaders, civil rights activists, feminists, students, and church groups. The campaign also inspired the Oscar-winning film Norma Rae (1979). Feeling the pressure, in October 1980 managers finally agreed to a truce. Despite the prominence of the Stevens campaign, this is the first book-length account, and it draws on a rich body of underutilized archival material. Blending these records with oral histories and press accounts, Minchin highlights the important influence that the case had on American labor relations, especially in encouraging other firms to copy Stevens' tactics. For the first time, Minchin also explores the role that race played in determining the fate of organizing efforts, showing how difficult it was to build grassroots interacial unions.